Sometimes you have to admit you don't know everything. Some things I know nothing about. (don't you dare tell my children) Sometimes you have to take a page from some one else for some inspiration! 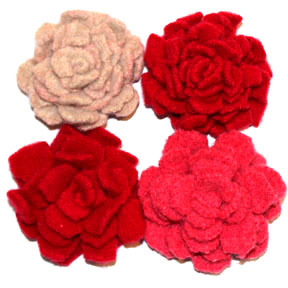 I bought some wonderful handmade felt flowers last weekend at our city market. 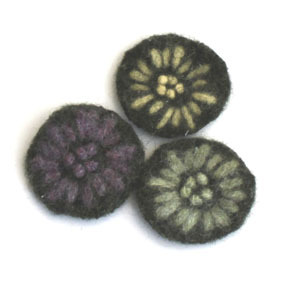 They were upcycled felted flowers and the artisan graciously told me a tidbit or two about them. I was in love. I bought more than a handful of them, which my 3 year old promptly laid claim to on sight. Well, great now I have to figure out how to make ME some. To the crafty friends to gave up their best links, and the author of the following blog instructions I used... ya all rock! Please read through the link below from Aunt Peaches for all the in and outs of "how to"! I am going to share some of my tidbits and tricks and before and afters for everyone! I have to tell you (shhhhh) I am having so much fun making these I want to give up ribbon... almost. Aren't these the cutest little things! First tip is when cutting sweaters apart its faster if you turn inside out, fold on the seam, and just cut the seam off leaving you the two panels. One cut to remove the seam saves you twice the time of cutting all the way down one side of the seam, then doing the same again. 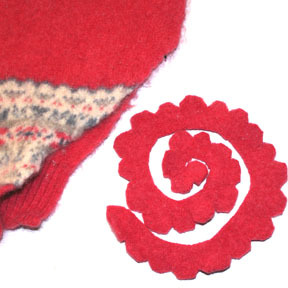 Have your sweaters in pieces? FABULOUS! Throw them in your pillow cases. These are going to pill, fuzz, and freak out. You do really want that contained, and not wandering free in your washing machine. Seriously. 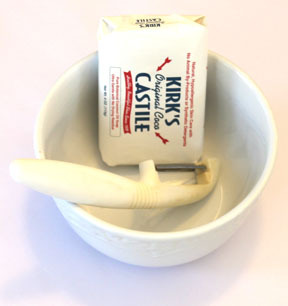 For shaving the soap Peaches used a really wonderfully sharp looking knife. If you haven't learned anything about how things go around here sharp is generally bad. That's like an engraved invitation for an emergency room visit. Vegetable peeler... much safer. And pretty. 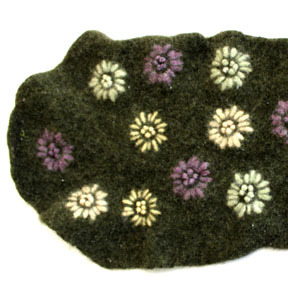 I am considering putting a bowl of little soap curls in my office for fragrance. Here's my little pillow case sweater army below. Yes, those are hair elastics holding them shut. I couldn't find a rubber band in my house with a gun to my head, but pony o's I can find! The hold really well in the washer too. 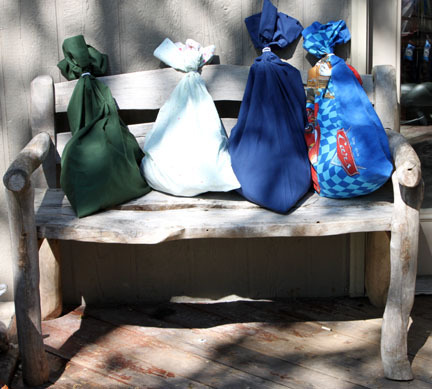 Here's a picture of the sweaters we started with in these bags. I bought 4 100% wool sweaters at the thrift store. All were $3.99 to $4.99, not bad. They were all interesting to me in different ways. A couple of them I just wanted to see what they looked like when they felted. 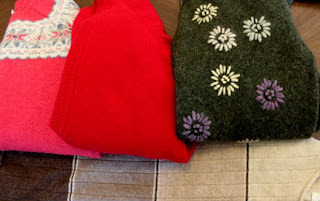 I followed the instructions and the green one only needed one washing to felt, the other three sweaters needed a second go in the machine to felt up. 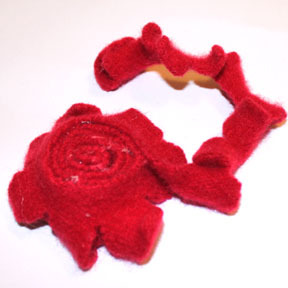 Here is what they looked like after felting! 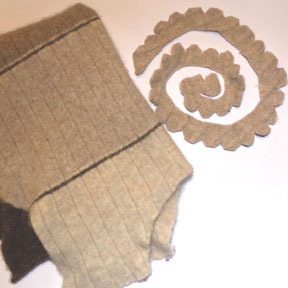 This little oatmeal sweater kept its ribbed look even with the felting! 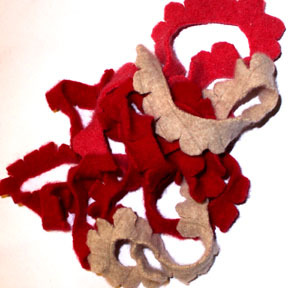 You can see here what the finished felt looked like when we were finished, and we cut out some spirals to make our flowers. I thought they looks pretty nice like this, but I threw them back in the dryer to see how much they would really round out on each petal. I am so glad I did! I loved them even more! 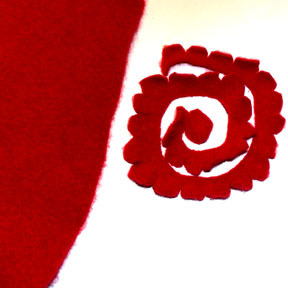 Below is a pic of before the go in the dryer, and you can see the rounded edges in the following pic where we started to glue our spiral into a flower. For the green sweater I couldn't decide what do really do with them. I think sometimes simple is better. Aren't these the beautiful! LOVE love LOVE these! Heck and all i need to add is a little bling, a pin back or hair clip and my Mother's Day gifts are d-o-n-e! Thanks for the tutorial. I have been wanting to recycle some of my old wool sweaters into flowers for my grandbaby. Thanks for the tute and the pictures. Hey Wendy! I am so glad you took this and made it your own. Well done!! !